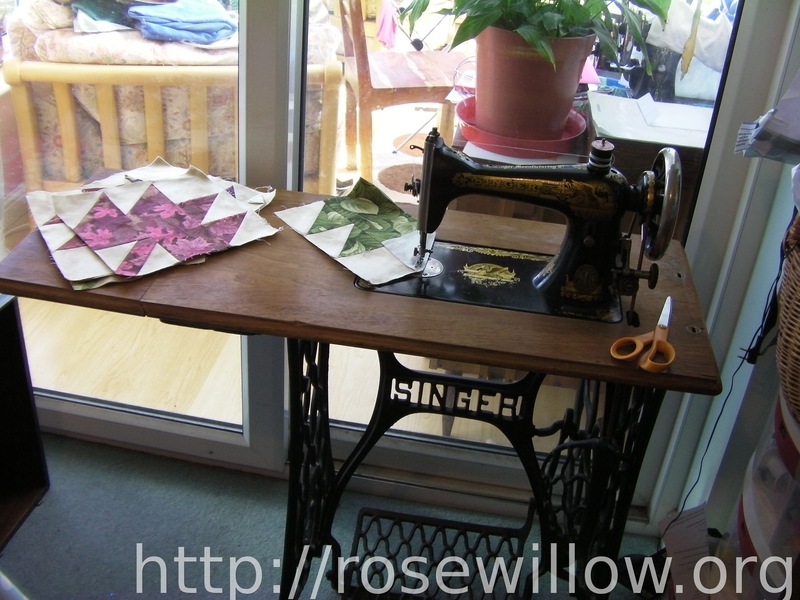 Today I’ve been sewing on “Lavinia,” my Singer 15K treadle machine from 1907. First I cleaned her and oiled her, and then we made some Maple Leaf blocks. She sews such a lovely stitch! I’ve been trying to determine which sub-category this Singer 15 fits into — I know she’s not a 15K80 or 15-96. 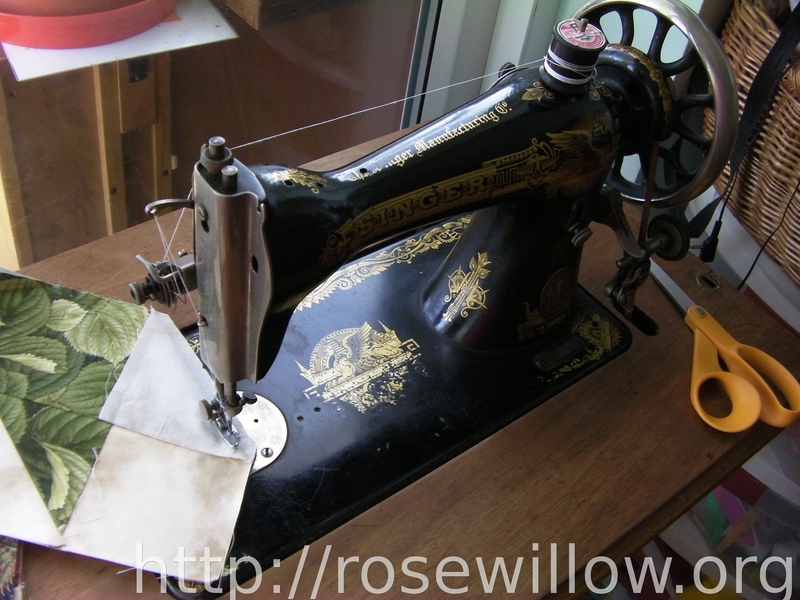 At first I thought she was a 15K30, but when I saw a photo of that model, I realised the bobbin winder is in the wrong place. The letter K just means that she was manufactured in the UK, at Singer’s Kilbowie factory in Clydebank, Scotland. Lavinia’s bobbin winder is in the lower position. The 15K30 photo I saw had the bobbin winder in the higher position, near the top of the machine. I like to think that someone spent many happy hours sewing on this machine. Look how worn her decals are on the machine bed! Maybe with her serial number you can classify her in a sub-category? She’s beautiful, and I’m jealous! Hmm–I have a 1905 handcrank Sphinx, I will have to go check the serial number to see if ours are “closely related”! My 1896 Singer 15 doesn’t have much paint left on her bed. It’s all worn off. No chrome on the hand wheel, either. I think she was well loved and used. She was my first treadle. I used her for TOBE blocks this summer. Aren’t they great!?! Yours is pretty. Thank you for sharing this information. Your machine is so pretty. The bottom looks like mine. And thank you so much for the soft envelope. An wonderful pattern idea. I must check my serial numers on my machines. What a lovely collection of old sewing machines ! I have just discovered your website and that was a very interesting reading. 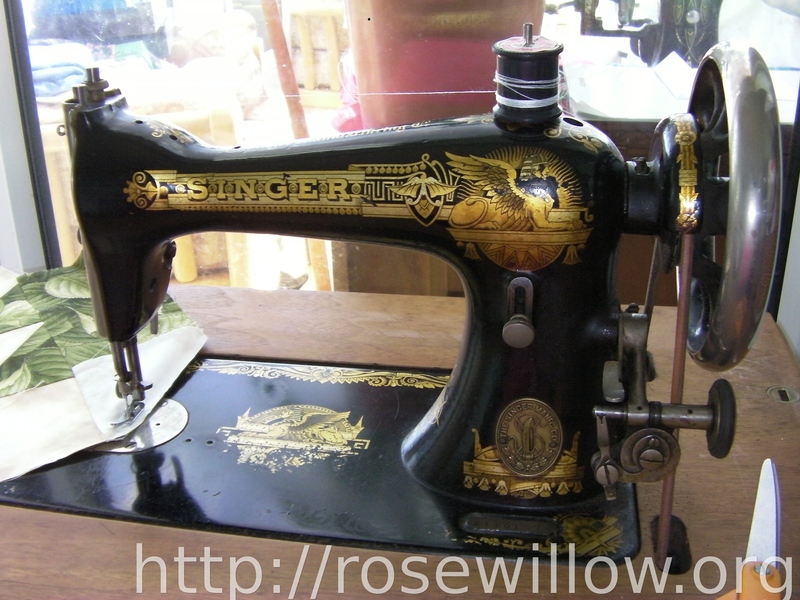 I only have one old sewing machine that looks like your “Livinia” but I’ve no idea of its sub-group. I only know from Ismac that it was made in 1918 in Scotland… But you’re right, it makes lovely stitches and I love it !